Harvest House was established as the V.T.H.S. 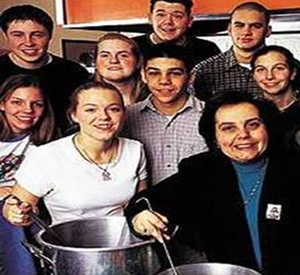 Hunger Project in September, 1997 by 13 students under the direction of Fran Spielhagen at Vernon Township High School in Vernon, New Jersey. On October 24, 1998, students hosted the first V.T.H.S. Harvest Festival, setting their sights toward establishing a center where lunch could be served to individuals and families in need. In April, 1999, the V.T.H.S. Hunger Project won the National Make a Difference Day Award and received $10,000 from Newman’s Own corporation. A vote by the trustees and congregation of the First Baptist Church in Sussex, New Jersey for use of their facility followed and renovations to the building commenced. On February 14, 2000, the first bag lunches were distributed. On October 30, 2000, hot meals began to be served on a daily basis. Currently, Harvest House serves 40 to 50 meals per day.